Sorry, I was thinking of the wrong type of troll. Today we are here to talk about the internet troll – those much maligned misanthropes of the online space. Lurking in every corner of the web, waiting to pounce on any unsuspecting and overly sensitive soul that that has the misfortune to pass their way. Trolls are thoroughly unpleasant individuals who use the relative anonymity that the internet provides in order to get their kicks by agitating people. They will start arguments, torment people who are suffering from illness or the loss of a loved one, and they will insult people because of any difference in race, sexuality, political viewpoint etc. They are often portrayed as children or teenagers, as the levels of immaturity on display would certainly fit that stereotype. However, they are just as likely to be normal seeming adults whom, if you met them in the street, you never in a million years would think be likely to engage in such behaviour. So, whether you are a business person or not, if you use the internet then you are likely to encounter a troll or two in your time. Trolls are inevitable, but their success is not. Allow us to help therefore as we present our guide on how to deal with trolls effectively. You may have heard this term bandied about before – but you may not know exactly what it means. Trolls are looking to provoke a reaction from those that they harass. Whether that reaction be embarrassment, anger, sadness is largely irrelevant. What is relevant is that you don’t give them the reaction that they are seeking. This is what we mean by not feeding the troll. Not giving them that which they are hungry for – i.e. attention. This is not to say that trolls should be ignored completely, just that you shouldn’t engage them in the argument that they are so desperately seeking. Trolls aren’t out to make a point or change people’s way of thinking; they are simply out to cause upset. Therefore if you try to debate the issue with them, you will fail and will more than likely end up lowering yourself to their level and getting into a slanging match with them. This is what they ultimately want. Remember, whilst you are getting angry, they are laughing. Instead engage the other people in the discussion about trolls in an intellectual manner, without responding to the troll directly. Start a discussion pointing out the troll’s presence and their attempts to derail an otherwise pleasant and intellectual discussion, encourage fellow users not to engage with the troll and maybe how any policy to limit them may be introduced. The troll will likely become frustrated and/or bored if you go long enough talking about them as if they aren’t there and will leave. Report the person to the page’s admin team. Even unmoderated pages usually have a “report abuse” function. Bullying is in violation of the terms and conditions of most forums and social networks, so don’t be afraid to report them for it. If you have a troll on one of the social accounts that you use for your business, then this can be a particularly precarious situation. Approach things in the wrong way and the resulting skirmish can leave the troll delighted and you looking very unprofessional, which can do real harm to your business. So, you need to address the issue, but you don’t want to make the situation worse. The last thing you or the public face of your business needs is to get into a protracted argument with another user. Instead of arguing with the troll, try being funny instead. This is quite a delicate situation and it’s important that you aren’t funny in a way that insults the troll. Instead try self-deprecating humour. In other words agree with the insult that is being flung at you, but in a humorous way. You may find that simply making a joke is enough to diffuse the situation. If not, don’t worry, sometimes you will simply have to block the user and delete their comments. Don’t worry if you have to do this, remember that they’re the one in the wrong. The best thing to do is to remain incredibly polite and well-written throughout any discussion with the troll. Most trolls will bail on a conversation if they can see that they are not getting the reaction that they are looking for. However, do not spend too much time interacting with them as you will also being playing into their hands by letting them take up and waste your time. Give them a few minutes then move on. 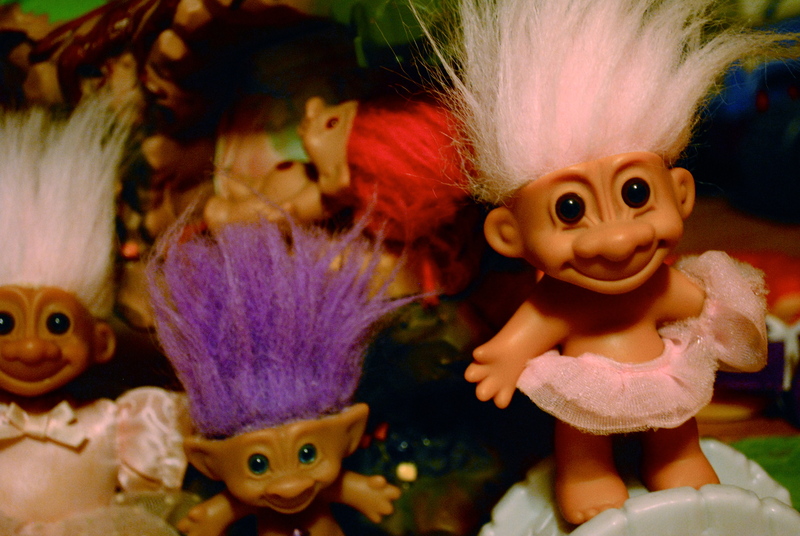 We hope that you enjoyed our little guide to dealing with online trolls. Please let us know whether you have had any experiences with trolls and what occurred? A troll blocked me. I did think he/she was younger than me. By blocking, I was unable to favorite and was only able to RT once, if at all.